“Respawn” is a code name from a total redesign of French video games website jeuxvideo.com. 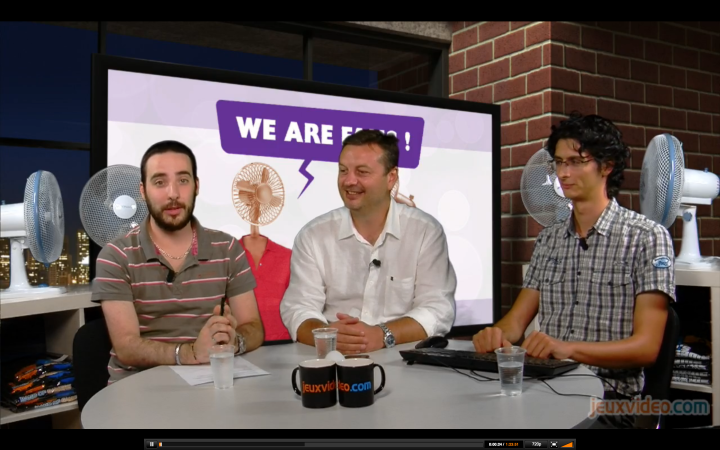 The project was unveiled on August 24, 2013 by Cédric Mallet, director of the site, during a live video. Jeuxvideo.com is one of the top french video games site. According to OJD, jeuxvideo.com has been visited by 59,430,507 times around the world and represents 535,854,371 page views. Cédric Mallet became director of jeuxvideo.com on september 2012. With, as it seems, the idea to change a lot of things, starting by the website design and even, if necessary, the website structure and operation. This is very brave and maybe utopia. Jeuxvideo.com, as many websites, uses an economic model based on display (ads banner) and depends a lot of number of impressions of this banner. Meaning the most important thing for commercials is the number of page views. Cédric Mallet talked about, if possible, finding a new way of earning money. Today, jeuxvideo.com has three ads on the home page, visible above the fold (even for smaller screen, the bottom one will be seen a little). But you have to add the possibility of “skin” ads (on the background) and pre-home ads (who will be displays on the center of the screen, usually a flash animation with a hard-to-click button to close it). This means five ads above the fold. Below the fold, you have at least one more ad as links. This one is less intrusive. According to him, in the beginning of 2013’s summer, jeuxvideo.com dev team started to work on some ideas for big changes on the website and started a new forum accessible to some selected users. With time, more and more users should be allowed to participate in this new forums, to give their opinion about how the new jeuxvideo.com should looks like and which features it should have. The main point of this forum is to give users voices for what to do. I really hope for them they already have their own idea about new kind of money resources. Unless they already know they’ll keep the current system. It’s a good idea to rethink the design. Design of jeuxvideo.com id very old. It’s a good idea to ask for users ideas too. They will use the website, they used it for a while, and certainly know what is wrong with the current design. Listening to the video, I understood they will go to a user-authored-content. Gizmodo US did something like this early this year. But I think jeuxvideo.com can go further. Per example, with video games tests, they can give users tools to create their own tests, and display link to these tests below the journalist’s one. The user will feel very considerate, be proud of this “official” and “recognized” link to his opinion and will make the promotion of his own article on social networks, meaning more free audience. If they keep a traffic-based source of money, this can be very profitable. A good point too is the discussion seen on the new forum about ads-block. Users understand very well the needs of websites like this and seems to accept it, at least, as long as the promotional ads do not interferes with their reading and their experience. If the experience becomes unpleasant or too intrusive, user’s response is ad-block. Then, the site looses completely the benefit of the user. The balance can be hard to found. It’s nearly impossible to make everyone happy. Especially with a lot of different opinion, and as we all know, everyone has his opinion and, all of the time, it’s the best opinion of the world. Most of users will be disappointed because “their” own feature has not been implemented. One final person will have to decide and, now they asked people for their opinion, they will have to explains every choices they’ll make and it will be very difficult to keep conversation away from haters. A lot of ideas will be discussed, it will be very difficult to order them. Find a place to a good idea can be very frustrating too if it not fit well with the chosen economic model or any other feature. Choices will have to be taken. For the development team, I think this will be a nightmare. They cut the talk in part. Each part, for a determined amount of time will be discussed in the forum and then, the dev team will have to work on the results, with the daily routine, bug fixing etc. Will they use a different technology? Node.js? I really hope they’ll succeed and I’ll try to stay informed of the evolution. I applause the daring of Cédric Mallet to start again from scratch and hope this encourage other websites to do the same. User experience is too often a low-priority. User Experience should be the top-list of design, as content and then, marketing/commercial needs who should be adapted to the content and how the user will enjoy it. Everybody will win. I added (thanks to Alexis) a short review of who jeuxvideo.com is at the begining of this article. needs. Without the global view as plan, as how to arrange them and which I goal, ideas risk to be bricks collapsing soon after launching. And with so much visitors, even a few hundreds cannot speaks for millions. Users do not like changes.